Gains ATK/DEF equal to the combined original Levels of the materials used for its Fusion Summon x 100. 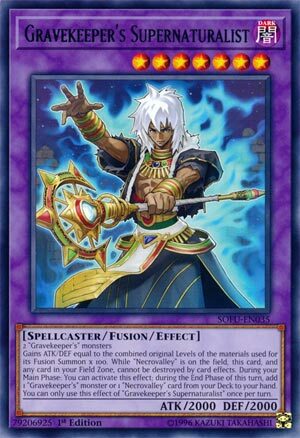 While “Necrovalley” is on the field, this card, and any card in your Field Zone, cannot be destroyed by card effects. During your Main Phase: You can activate this effect; during the End Phase of this turn, add 1 “Gravekeeper’s” monster or 1 “Necrovalley” card from your Deck to your hand. You can only this effect of “Gravekeeper’s Supernaturalist” once per turn. Gravekeeper’s got some support a little bit ago, and among it was a Fusion monster named Gravekeeper’s Supernaturalist. Easy for the archetype to summon, two Gravekeeper’s isn’t going to be hard at all to come by. Combined Level x effect for ATK/DEF gain allows for a big or small fusion, and with a base ATK/DEF of 2000, you likely will get between 700-800 ATK/DEF boost typically off the summon. I like the base stats, they are a throwback to a few OG Gravekeeper’s being boosted by Necrovalley. Speaking of which, that tacks on 500 more ATK/DEF, making Supernaturalist a pretty beefy monster. Protection for Necrovalley and itself from card effects is what Necrovalley needed so long ago. Your main card is safe, your monster is likely 3300ATK/DEF and safe from destruction by card effects, looking pretty good for Gravekeeper’s at this point. Built-in, cost-free search ability in the End Phase wraps up a pretty amazing card for such little to bring it out. Get a Gravekeeper or Necrovalley card from the deck to the hand, you have plenty of targets, and while you won’t be able to do anything with the card, it is still there to set up your next move. Great boss monster here with Gravekeeper’s Supernaturalist. He’s a Level 7 Dark Spellcaster-type Fusion monster with 2000 Atk and 2000 Def. He only requires any 2 Gravekeeper’s monsters to properly Fusion Summon. His only negative stat is the Atk is (naturally) low. However, with Necrovalley on the field, Supernaturalist would gain 500 more Atk which is significantly better, but not ideal. His own effect takes his Fusion materials and multiplies their combined levels by 100 to effetely gain 500-800 more Atk points. Now we have a beefy boss with built in protection if Necrovalley is on the field. If it is, Supernaturalist and any card in your field zone is protected from all destruction effects. That is great protection, and I like that it doesn’t specify whose destruction effects, so go ahead and run some Torrential Tributes for more nostalgia. Finally, Supernaturalist can activate an effect during a Main Phase that searches you a Gravekeeper’s monster or a Necrovalley card from your deck to your hand during the End Phase. A free once per turn search of all the major components of your deck is really good. High Atk, built in protection, and that search makes Gravekeeper’s Supernaturalist outright awesome. In an era where almost anything can get support, I mean we are getting new Neos cards in the next set, it doesn’t shock me too much to see Gravekeeper’s get some new pieces to their arsenal, so here is their first ever Fusion Monster, Gravekeeper’s Supernaturalist. Supernaturalist is a Level 7 DARK Spellcaster Fusion with 2000 ATK and DEF and requires 2 Gravekeeper’s Monsters as materials. The requirements are obvious considering it is in the archetype and is easy to achieve in Gravekeeper’s, 2000 ATK and DEF is meh on a Level 7 but it does boost its own attack along with Necrovalley, DARK and Spellcaster is a strong combination. Supernaturalist gains 100 ATK and DEF times the Levels of both the Fusion Materials you used for this. The least I see this getting to is 700, using Recruiter and a Level 4 Gravekeeper more than likely and I imagine it’ll be rare you use the new Level 3 and Recruiter for the Fusion Summon. That boost plus Necrovalley will make this a respectable 3200. While Necrovalley is on the field, this card and any card in your Field Zone cannot be destroyed by card effects. Necrovalley will never stop being important to Gravekeeper’s, even if it gets a retrain, it’ll likely always be treated as Necrovalley, so this is good protection to have. If you control Gravekeeper’s Priestess, then the field is treated as Necrovalley, but I never seen Priestess played, so yeah. During your Main Phase, you can activate its effect to where you can search a Gravekeeper’s monster or Necrovalley card during your End Phase and this is the hard once per turn effect of Supernaturalist. Nice way to tutor for any Gravekeeper’s monster, but the archetype got it’s own searching Spell in Necrovalley Throne, so you’ll likely get a Necrovalley card. The obvious card that comes to mind is Necrovalley, but you got Gravekeeper’s Commandant for that, which Necrovalley Throne searches. You can search for the aforementioned Necrovalley Throne to get an extra Gravekeeper’s Normal Summon or a search for a Gravekeeper that you might need next turn. Necrovalley Temple, the new trap, will be good for making sure you always have Necrovalley. The best option to search for though is either Imperial Tombs of Necrovalley (the archetypal Solemn Judgment basically) or Hidden Temples of Necrovalley (the archetypal Vanity’s Emptiness) and it can be insane to search for a Solemn Judgment or Vanity’s Emptiness like card. Gravekeeper’s Supernaturalist is a good Fusion monster for an old archetype and will likely be played in multiples in standard Gravekeeper’s decks. Art: 4/5 Well designed art, Gravekeeper’s always have good art. Gravekeeper’s Supernaturalist is a new piece of support for the Gravekeeper clan. This is a Level 7 Fusion Monster, with a generic summon requirement of any two Gravekeeper Monsters. 2000 attack and defense are rather paltry for the Level, (but more on that in a minute) and this Monster is also a Dark attributed Spellcaster. So, is our Fusion friend worth playing? First you’ll note a power-up effect. Supernaturalist gains attack (and defense) x100 equal to the Levels of the combined total of the Monsters you used for this Fusion Summon. (So you’re likely using either 2 Level 3, 2 Level 4, or 1 Level 3 and a Level 4) which increases our base 2000 attack up to the 2600-2800 range, which should be plenty to deal with most anything. So, Supernaturalist offers protection, so long as Necrovalley is on the Field. This card, as well as Necrovalley, are immune to destruction via card effects. This, in a word, is fantastic. Protection is always welcome, and with Necrovalley being such an integral part of the Gravekeeper strategy, we like this a lot. The attack boost just got more important too, as your opponent will have to attack this card to get rid of it. Finally, once a turn, you can choose to during your Main Phase, have a Gravekeeper Monster or Necrovalley card added from your Deck to your Hand during the End Phase of the turn. Being able to fetch a piece of support, or the Gravekeeper Monster of your choice is delicious as well, and adds some speed to a Deck that isn’t one of the fastest out there. Powerful, protective, searches and adds resources…very good indeed. Art: 5/5 Very nice, detailed, colorful art. Kind of has an anime character feel to me. That face says he is calm and in command. Very confident looking.